The Quechua Forclaz 10° Ultralight sleeping bag comes in a small range of colors with a hood to keep your head warm on chilly nights. It's a “mummy-style” bag, which essentially means it tapers off towards the bottom. This helps keep it smaller, but some people find this style of bag cramped compared to more rectangular versions. There are two sizes, medium and large, with a pair of three-quarter length zips to give extra airflow in warm or stuffy rooms. You can also join two Ultralight bags together if you're traveling as a couple. The large version of the bag weighs in at just under one kilogram (2.2 pounds), and 217 x 80 cm (85 x 31.5”) when unrolled. The medium model weighs slightly less and is both a little narrower and around five inches shorter. Whichever model you buy, the compression cover and straps make it noticeably more compact in transit. It's 100% polyester inside and out and can be machine-washed. Unless you have access to a gentle commercial dryer, you'll need to hang it out to dry, however. The Forclaz 10 is marketed as being “comfortable” in 10-15 C(50 - 60F). One of the main reasons for choosing this particular sleeping bag was the need for it to fit into a 30-liter daypack. Thankfully, it comfortably did, the petite size of the bag impressive not only in the shop but also when quickly packing up in the morning. The compression straps are partially sewn into the cover, which means you can't lose them, and also makes them easier to use. 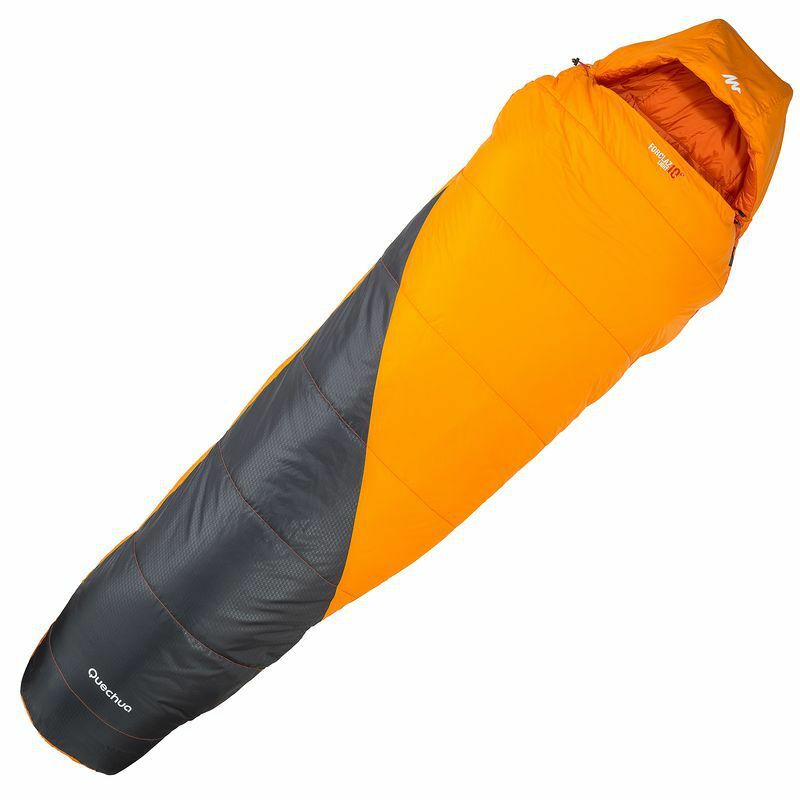 Unlike many other sleeping bags, this one was easy to roll up, and it took under a minute to stuff the bag into its cover, cinch the straps, and pack it away. The hood is most valuable for people who sleep on their back or side, but even those who lie on their front will find a use for it as a makeshift pillow cover when necessary. If there are no pillowcases available, or you don't like the state of the one you've been given, stuffing the pillow inside the hood and lying on it is a much more pleasant option than lying directly on the same pillow as hundreds of other people before you. If you don't have anything to rest your head on at all, you can even put sweaters, t-shirts, and other clothing inside the hood, and use it as a makeshift pillow. The bag is sufficiently spacious for those of average height and build to remain comfortable, without feeling particularly cramped. While the zips initially seemed like they might be uncomfortable to sleep on, the padded internal flaps keep them from digging into you most of the time. Hiking during spring in southern Spain, temperatures were typically quite warm during the day but dropped to 40F or less overnight. The accommodation was either poorly-heated or had no heating at all, so it wasn't a great deal warmer inside than outside. In early fall in northern Portugal and Spain, things weren't much different. While it was too hot to sleep in the bag for the first few nights, it was decidedly cool overnight towards the end of the hike. The bag remained warm and comfortable in the cooler conditions, but wouldn't have if the temperature had dropped much further. Adding a sleeping bag liner and/or an extra layer of clothing would let the bag handle colder temperatures, however, as long as you were indoors, or at least out of the wind. Overall, the Quechua Forclaz 10° Ultralight is a solid performer across three seasons. Warmth shouldn't be a problem unless the outside temperature drops into the low 40s, and even then, the bag was big enough to accommodate a liner and extra clothing. It was easy and quick to pack away, small and light to carry, and comfortable to sleep in. It's an excellent budget option for those looking for a small, lightweight sleeping bag for their next trip.